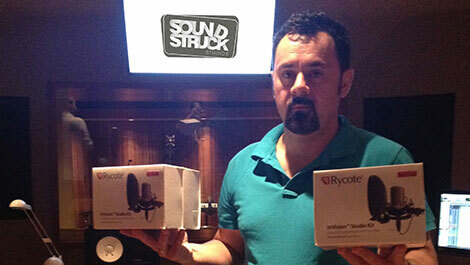 Nicolas Kyvernitis Electronics Enterprises, distributors in the UAE for Rycote have recently supplied Dubai based audio production studio Soundstruck Studios with sets of the InVision Studio Kit. Designed by acoustic guru, Wes Lachot, SoundStruck Studios will be an international standard, state of the art recording facility based in Dubai. The InVision™ Studio Kit is a complete suspension and pop filter system, which combines the Universal Studio Mount (USM) with a new Universal Pop Filter to make a complete vocal microphone suspension and pop filter system that will accommodate virtually any microphone. The Pop Filter is designed to lock tightly on the USM's outer support ring, where it can be left while mics are quickly and easily swapped in the USM. Rycote’s Studio Kit is fast and easy to use, and has also proved to have harder-wearing, more vibration-resistant and better protection for vocal pops and thumps without high-frequency loss, than any traditional elasticated microphone suspensions.